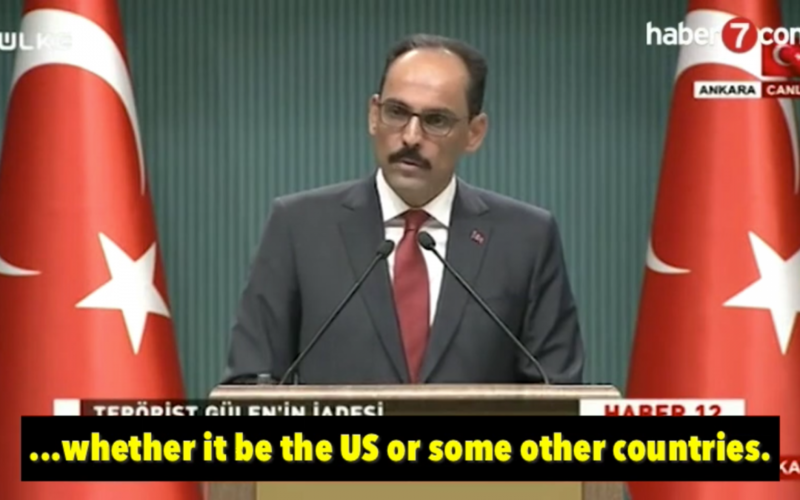 Turkey’s Presidential Spokesperson İbrahim Kalın said during a press conference on Friday that the Turkish government will continue its global manhunt against the followers of the Gulen movement stating that the operation could take place in the US as well. Kalin said “our relevant units” will continue its operations against FETO like the one in Kosovo, whether it be the US or any other country. “FETÖ” is an abbreviation for the Gulen movement, coined by the Turkish government to label the movement as a terrorist organization. The government accuses the movement of masterminding a July 15 coup attempt in Turkey while the group denies involvement. What follow are official transcripts of a media member’s question for Kalin and of his answer. So far, a number of countries like Saudi Arabia, Malaysia, Georgia and Myanmar handed over academics, businessmen and school principals upon the Turkish government’s request despite the fact that some of those victims already had refugee status with the United Nations. In some countries, the MIT led the arrests itself with or without the involvement of local law enforcement.